Tell most people a volcano is erupting and you can bet most of them will start running in the opposite direction before you finish the sentence. 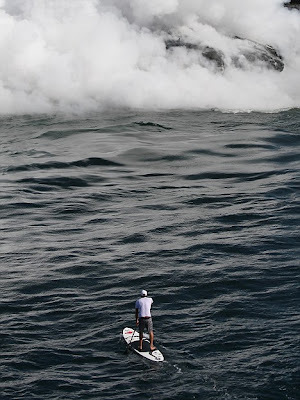 But not in the case of pro-surfer C J Kanuha, who grabbed his board and paddled out to sea to get a closer look as the lava of the world's most active volcano, Kilauea, hit the waters. 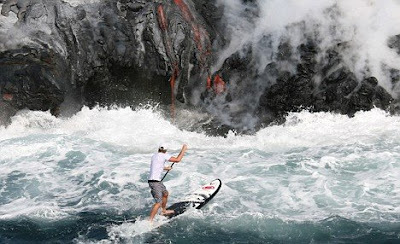 Tentative at first, the adrenalin-junkie paddled to within 20ft of the lava, before moving back from water that reached 200C in places, melting the wax on his surfboard and burning his feet in the process. 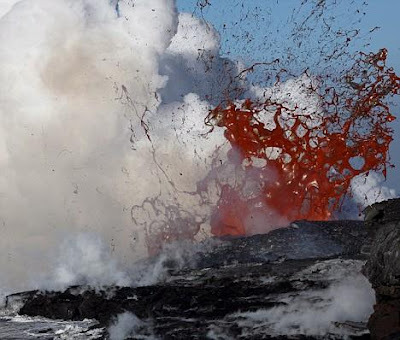 Kilauea, meaning 'much spreading', has been continually erupting in Hawaii since 1983, but more molten rock than usual is flowing from an outbreak that started last November. Lava has been spewing as high as 150ft in the air at temperatures up to 1,200C and a surface flow is snaking east from the crater. 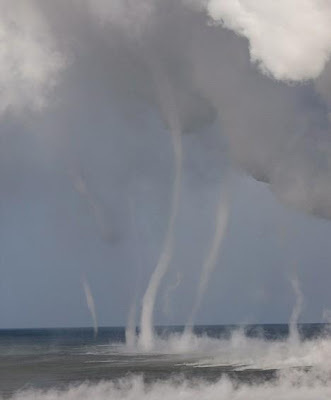 Meanwhile, underground 'tubes' are expelling lava into the Pacific ocean creating huge clouds of steam and ash. But none of this fazed C J as he set out on his daredevil mission. Scientists at the Hawaiian Volcano Observatory have also reported an 'unusually high amount of sulphur dioxide gas' emerging from one of the craters. Kilauea is a low flat shield volcano. It is the youngest on Big Island and sits on the south-eastern side. The volcano has its own magma-plumbing system, extending to the surface from more than 60km deep in the earth. The near constant eruptions have proved an invaluable resource to geologists but the volcano has proved to be a dangerous neighbour. Kilauea releases a volcanic gas, known as vog, which can irritate respiratory problems. High levels of the noxious fumes have killed several people in the past. In 1993, a tourist died when the portion of cooled fresh lava on which he was standing broke away and fell into the ocean. The lava flow has also destroyed homes and sections of the coastal highway over the last two decades. Kilauea is the home of Madame Pele, the Hawaiian volcano goddess. 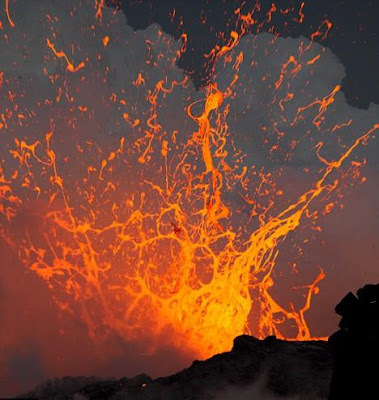 Hawaiian chants and oral traditions tell of the many eruptions created by an angry Pele before the first European, the missionary Reverend William Ellis, saw the summit in 1823.